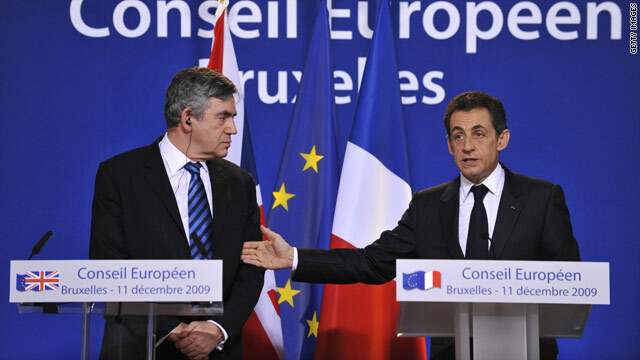 Prime Minister Gordon Brown and President Nicolas Sarkozy announce to pledge billions in fighting climate change. London, England (CNN) -- European Union leaders have agreed to pledge 7.2 billion euros ($10.6 billion) to help developing countries deal with the effects of climate change over the next three years. The agreement will see all 27 member states of the EU pledge money and is seen as a major boost for a deal to be reached at the U.N. climate change summit in Copenhagen. The deal was struck on the second day of a EU summit in Brussels and leaders plan to make the money available in a "fast start" fund for nations to help poorer nations deal with rising sea levels, deforestation and other problems related to climate change. Yvo de Boer, the U.N. Framework Convention on Climate Change Executive Secretary, hailed the move as a "huge encouragement to the process." "Well, I think it really is very encouraging indeed that Europe has now agreed to a sum that it's willing to contribute to short-term finance," Mr. de Boer said. The EU pledge will make up a substantial portion of the proposed $10.6 billion global fund to help developing nations fight climate change each year. Video: What is carbon trading? Earlier in the day, UK Prime Minister Gordon Brown and French President Nicolas Sarkozy announced that their two countries would pledge a total of 1.7 billion euros ($2.4 billion) spread over the next three years. The two leaders also agreed to work for an ambitious deal in Copenhagen and for the EU to reduce its emissions by 30 percent by 2020. "There's never been any doubt that we would have to put up some money from the richest countries," Brown said. "What we are seeing today is a very significant move forward in the search for a Copenhagen agreement." However, some climate change advocates were less than impressed by the pledge. "In Brussels today, EU leaders only offered small sums of short-term cash," Tim Gore, Oxfam International's EU climate change policy advisor, said. "Worst of all, this money is not even new -- it's made up of a recycling of past promises, and payments that have already been made." Ben Stewart, a campaigner with Greenpeace also agreed that helping the developing world cope with climate change would take a lot longer than three years. "Climate change won't end in three years, carbon emissions from poorer countries won't end in three years, and neither should the cash," Mr. Stewart said. "It's in our own self-interest to help poorer countries slash their emissions, as well as being the moral thing to do."